Pope Francis begins a highly anticipated seven-day South American trip on Sunday that includes stops in Ecuador, Bolivia and Paraguay. This visit has a special meaning to South Americans because Francis, born Jorge Mario Bergoglio, is a native of Argentina, and is the first Latin American pope in the history of the Catholic Church. This will be the first official visit for Francis – a former Jesuit bishop – to Spanish-speaking South America since he was elected to lead the Catholic Church in 2013 after the resignation of Benedict XVI. 1Latin America is home to more than 425 million Catholics – nearly 40% of the world’s total Catholic population. 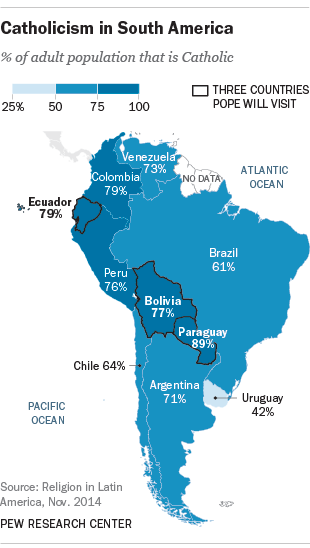 Moreover, in most South American countries, at least seven-in-ten adults identify as Catholic. Indeed, in only one Spanish- or Portuguese-speaking country in South America (Uruguay) do Catholics make up less than half of the adult population (42%). 2South Americans have widely embraced Pope Francis, the first head of the Catholic Church elected from the New World. Approximately two-thirds or more of adults in every South American country express a favorable opinion of Francis in a Pew Research Center survey, including 91% in his native Argentina. Among South American Catholics, views on Francis are even more positive: At least 75% of Catholic respondents throughout the region have a favorable view. Moreover, majorities of Catholics in most South American countries say Francis represents a major force for change in the Catholic Church. 3 In contrast with the warm regard for the pontiff by people who currently say they are Catholic, the sizable number of people in the region who have left the church are cooler toward the pope. Only in Argentina (73%) and Uruguay (63%) do clear majorities of former Catholics say they have a favorable opinion of the pope. 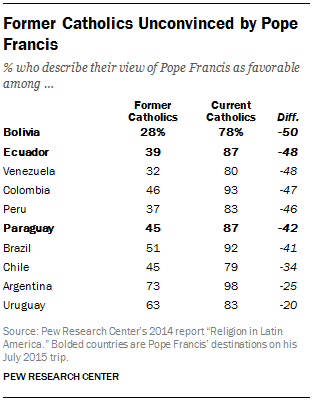 Elsewhere, no more than about half of former Catholics give the pope a positive rating, with favorable opinion especially low among ex-Catholics in Bolivia (28%) and Venezuela (32%). 4 During his trip, the pope is expected to speak about social inequality. The recent Pew Research Center poll in Latin America shows that the pope’s concerns about inequality are partially shared by the populations in three countries he’ll be visiting. Roughly three-quarters of adults in Paraguay believe the gap between the rich and the poor is a major problem in their country, and substantial minorities in Bolivia and Ecuador (45%) echo this view. 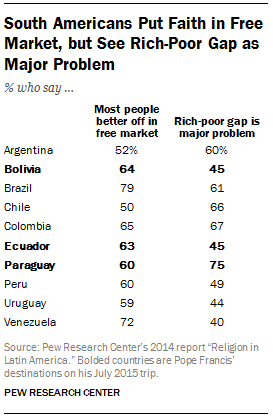 Still, majorities of adults in all three countries, and in most other South American countries, think most people are better off in a free-market economy. 5During this visit, Francis will not be stopping in his home country, Argentina. Francis has not been back home since he was elected pope, and is reportedly staying away this time because he does not want his visit to become politicized, given Argentina’s upcoming presidential elections. The pontiff also is skipping Portuguese-speaking Brazil, the country with the largest Catholic population in the world, which he visited in 2013 for World Youth Day. The last pope to visit Ecuador, Bolivia and Paraguay — three of the least populous countries in the region — was John Paul II, in the second half of the 1980s.